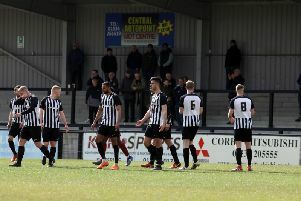 Corby Town head to Berkhamsted for a big game in the Evo-Stik League South Division One Central this weekend with boss Steve Kinniburgh knowing the margin for error is “really small”. The Steelmen returned to winning ways after back-to-back losses with a 3-2 success over Aylesbury United at Steel Park last weekend. The victory kept them in third place and they now sit three points behind second-placed Bromsgrove Sporting and five off leaders Peterborough Sports. Now Corby open December with a tricky test at Berkhamsted who sit just a point behind them in fourth spot. And with the league table really taking shape, Kinniburgh believes his team cannot afford many mistakes if they are to challenge for the sole automatic promotion spot. “The margin for error is really small,” the Steelmen boss said. “When you look at what Peterborough, Bromsgrove and us have done so far, it suggests it is really going to come down to wins. “It will be the team who turns draws into wins and not losses into draws who will go on and finish at the top. I think draws will always be a case of two points dropped and not one gained when you look at the top of the division. “It’s up to us to try to be as consistent as possible and if we do that and we perform like I know we can then we will be in the mix. “Berkhamsted are on a decent run, which has put them in a good position in the league. “I think the table is really starting to shape up and it is looking like it will be quite interesting. “There are teams like Berkhamsted and Thame who have really picked up in recent weeks and there is also Bedford Town who have game in hand on everyone else. “I am sure things will unravel even more over the next seven or eight matches as we go into the new year.